It’s rare for me to include photographs of aircraft on here. Everyone photographs them – well, millions of enthusiasts do – and from my perspective, they have little to do with my professional photographic practice. But I should add to that, ‘so far’, as I can and will photograph aircraft to commission, as I will most things. This, however, is a shot taken just for pleasure. This, so I am told, is a 1950s Lockheed Constellation. As someone who does not share the obsession that some have with these machines, taking this photograph was just a rare impulse, prompted by the look of the thing: that mixture of beauty and nostalgia; its age and neglect writ large in the oxidised aluminium of the fuselage and in the faded and peeling paint. This was taken a few years ago and that leaves me wondering if this was ultimately a restoration project and whether it has since been made beautiful again and taken to the air. It would be pleasing to think that it has. 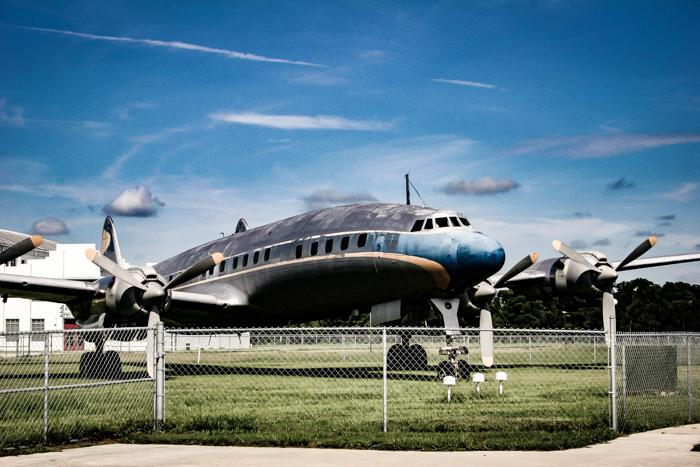 The photograph was taken at an air museum in Florida. It was shot at ISO400 55mm f16 and 1/500th. It has been substantially edited to bring out the decay in, or staining on, the metal, which was to a degree hidden by the bleaching effect of the extreme Floridian sunshine, which can makes so much of a shot vanish into glare, and some graininess has been added to give the photo sense of age.